We have examined the Biblical and literary record for evidence of the Apostle Peter at Rome. We have sought an authoritative, well-substantiated link with the actual events of the later life of the Apostle, but the search for footprints scarcely turns up shadows and, what was hoped to be proof, under careful examination proves to be little more than a clue. Competent and learned scholars make such admissions, yet it is interesting to note how many find the tradition attractive nonetheless. "It is difficult to suppose that so large a body of tradition has no foundation in fact" is the way the escape clause usually reads. And while that may be true, it does not constitute proof. Attractive conclusions, it must be remembered, can be false. And there may be explanations beyond the obvious. All this is not to say that Peter never was at Rome for the evidence, while not supplying proof for the positive, does not give us grounds for so negative a conclusion either. The author does not seek to prove that Peter was never at Rome nor even that he may have died there, for those are both possibilities. This thesis does seek to show, however, a thorough examination of the available evidence that there is no positive proof linking Peter with Rome. The burden of proof is upon those who make weighty claims about Peter's life and death in that city, and use those claims as the authority for the foundation of a great religion. To show that those claims are not well-founded and historically proved, is sufficient. A true tradition? No. An "historical theory"? Yes! That is a good way to describe what we see evolve before our eyes in the record of Peter at Rome. But who would have framed such a theory? And why? Perhaps an equally good word would be "explanation." Who would have devised such an explanation and why? Need for Peter in Rome? Could it be that there was a definite need for such an explanation or theory on the part of some? If so, this would account for the fact that the evidence all goes one way. Perhaps what we have is not a true tradition, the original details of which are revealed one by one with the turn of the centuries, but rather an explanation, justification, or "theory" that goes in the name of fact, the details being safely added long after the true facts had been lost or forgotten. In the literary evidence we may not be witnessing a true tradition coming to light, but a false legend being created because of the need for such a fable. 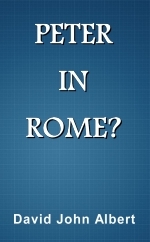 What if only one Peter had ever been in Rome after the establishment of a religious tradition based on his stay there? And what if time and circumstances proved him to be an imposter — a Simon the Magician who took to himself the name Peter? Would there not then immediately rise the need to find at Rome a true Peter upon whom to rest that tradition if it was to be perpetuated? False religious leaders of that early period may have been eager to make their theory fit the facts rather than acknowledge that their authority stemmed from the wrong Peter. The point of setting forth this possibility is not to prove that such a dark conspiracy took place, but to offer a possible explanation for the evolving Petrine tradition. While such a legend may have had its original roots in truth, we must also allow that they may have been just as deeply rooted in error. And while the literary evidence may have been set forth as helpful additions to a true story, they may also have been added by men who were strongly motivated to preserve what was already in their day a well-established religious system. Failure to discover a true apostle of God named Peter in the city which became the seat of their activities would have proved fatal, which is to say that theirs may have been the best kept secret of the ages! We know, if only from the contradictions, that not all of the story is true. Other portions can be proved to be false. If all of the facts were known, is it possible that the entire theory would prove a monumental hoax spawned about the time of the outpouring of the apocryphal literature, the middle of the second century, or before? Biblical and literary scholarship has demonstrated that we must not be gullible and unsuspecting. "Prove all things," we are exhorted, "hold fast that which is good" (I Thes. 5:21).